Njada Stonearm is a Nord warrior and member of the Companions. She resides in Jorrvaskr within the walls of Whiterun. When you enter Jorrvaskr for the first time, you will find her engaged in a brawl with Athis, a fight that she always wins. She is an expert trainer for Block, and if you are a member of the Companions she will train you up to level 75. She isn't very social and likes to keep to herself. 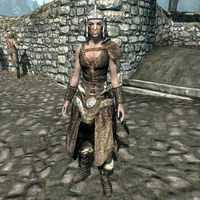 During the day she can be found around Jorrvaskr, either outside by the training dummies or inside, where she eats meals and sleeps in the living quarters. Njada isn't shy about letting you know how she feels about you joining the Companions. A typical greeting from her may consist of her snidely stating: "Oh, it's you." In passing, she can be heard saying: "I'm still trying to figure out why Skjor let you in in the first place." as well as: "If the Circle vouches for you, I'm sworn to respect their judgment. But that doesn't mean I like it." When asked what it means to be a Companion, she will reply: "Just because you've been accepted here so quickly, don't think I'm going to help you rise any faster. Fight well, don't be a lout, and you'll be fine. You don't need my help." Healing her using Restoration magic will result in a similar dismissal: "I suppose you think this makes you better than me cause you can do that, huh?" She will remain unimpressed with you once you become the Harbinger, but will still follow orders and accompany you into battle. However, at this point she becomes a potential candidate for marriage, and can be recruited as a follower. Njada is clad in a set of hide armor, including matching pairs of bracers and boots, as well as a hide helmet. She is equipped with a Skyforge steel sword and a steel shield for close combat, and a hunting bow with iron arrows for ranged combat. Njada has rather lackluster health for a warrior, making it a good idea to give her equipment with enchantments that augment her health. If sacrificed to Boethiah, Njada Stonearm may respawn later in the game. This bug is fixed by version 1.0 of the Unofficial Skyrim Patch. She may become permanently hostile towards you at random, and cannot be killed. ? She can be calmed with a calm spell or the Imperial race's greater power, "Voice of the Emperor". The console command setav aggression 0 may fix this. This page was last modified on 15 November 2018, at 20:57.